Private home borders national forest. Miles of hiking and cross-country ski trails are right out the back door. 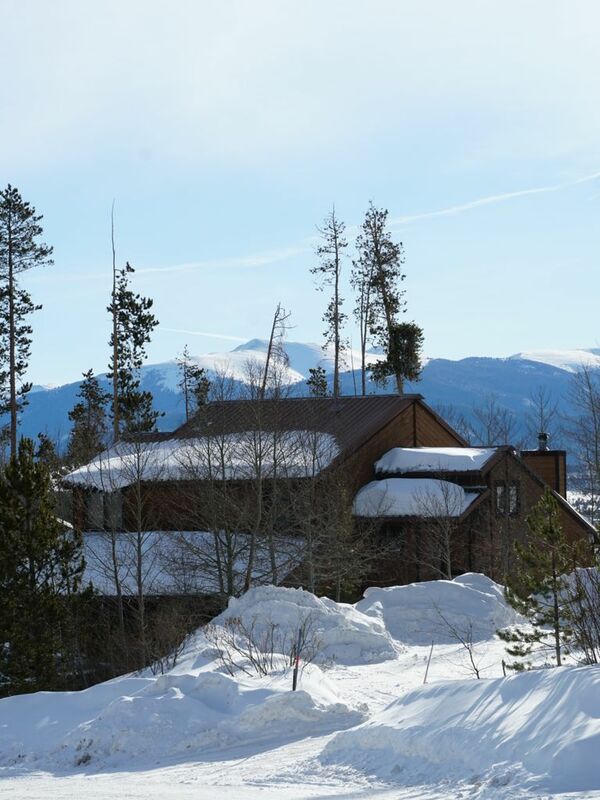 Close proximity to four major ski resorts in Summit County - Keystone (8 mi. ), Copper Mountain (13 mi. ), Breckenridge (16 mi. ), and Arapahoe Basin. Vail is just 30 miles away. Shopping(including outlet mall)and a variety of restaurants are just minutes away in Silverthorne, Dillon, and Frisco. This two-story, 1100 square-foot home features two bedrooms each with a queen-sized bed. A twin-sized day bed is available in the loft overlooking the vaulted living room. A queen-sized sofa bed is also available in the living room. There are two full baths - one upstairs and one downstairs. A separate dining area and a fully-furnished kitchen make cooking in an added plus. Lower-than-market rates makes this home ideal for families and couples looking for a nice, restful spot for their Colorado vacation. No smoking in the house or on the deck. We have owned our home for almost 30 years. We love that the U.S. Forest Service land behind our house means privacy, views, and hiking trails that allow for an easy 30 minute stroll or a long day hike from right out the back door. The aspens located on the property provide wonderful sceneray while the meadow and forest beyond the property provide amble recreation opportunites. We don't get to use our house as much as we wish that we could. So we are delighted to share it with those seeking a nice weekend or longer stay in the beautiful Colorado mountains. One bathroom is downstairs and one bathroom is upstairs. Condiments, spices, and cooking staples usually stocked. Full kitchen with smooth top stove, oven, microwave and fridge. Condiments, spices, and miscellaneous cooking ingredients usually stocked. Summit County hiking/cross country and history books are available. This spacious duplex was very roomy and comfortable for our family of 4. The back of the house backs to national forest and is gorgeous to look at from inside the house. Would definitely come back. This excellent duplex is located in the Silverthorne condo communities above town but is nicely tucked beyond the busy roads and nestles right up to the national forest, affording beautiful, unobstructed views - especially of sunrises. It is a peaceful corner - especially for this area. The kitchen is very well equipped, with excellent stove/oven, refrigerator and dishwasher. 2 full baths (one up, one down); the upper bath is jetted. The day bed (twin) is fine for a teenager, young adult or extra traveler. The living space is open, and two storied, with a ceiling fan, nice table for dinners and puzzles/games; with extra space for those who would rather read, watch TV, or simply enjoy the wood burning fireplace (logs supplied). It even warmed enough to enjoy the BIG deck. We had a fantastic New Year celebration away from home and enjoyed skiing at Copper Mountain. FYI: King Sooper CIty Market has discount Copper and Loveland tickets) and the owner provides a City Market shopper card to get the other grocery discounts. Skiers: this is a great central location with the advantage of a garage for rented or owned equipment. The owner is responsive and thoughtful. Everything went exceptionally well and the pictures from the back, on this site, are truly accurate. So beautiful! We thoroughly enjoyed our stay at this cozy condo. It was the perfect size for our group of 4, and the location was also perfect for skiing in Summit Co. We were close to restaurants and shops in Silverthorne. The condo was very comfy and the kitchen had everything we needed. The views out the back were lovely and we enjoyed the beautiful trees and nature that surrounded the property. Would definitely stay again! Great accommodations! Very well stocked for all your needs. The view from the balcony was beautiful! We had some vehicle issues upon arrival and a neighbor was kind enough to help us out! Quiet neighborhood! Will definitely book again! Great location for a ski weekend and a great place overall! Kitchen was well stocked with all the necessary tools and perfect for our uses. House was clean and plenty big enough of two couples. Would definitely visit again! No smoking on property. We normally accept payments by check. We will also accept PayPal for an additional 2.9% fee on rental rate.